How can I get my builder to read the plans? Subject: New fireplace problems - Can we Rumfordize it? I am wondering if you can help me with a new fireplace we have just had finished in our new home. 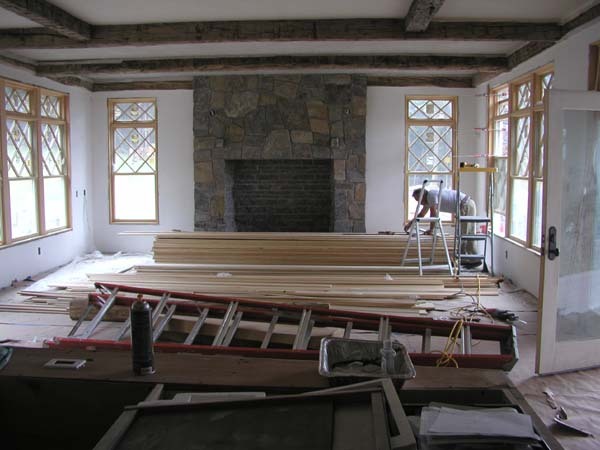 The architect had specified a traditional Rumford design, and we hired a mason who constructed it. When he was near completion, I realized the size was not consistent with the plans. When I questioned the mason, he said he had built me a Rumford fireplace, and discussed its merits over other fireplace designs. He guaranteed it would work well and I wuld be pleased so I let it go until we could test it out. Now we test it, and it smokes terribly. I have now investigated the Rumford design, via your website, and lo and behold, we do not have a Rumford design at all. The back of our fireplace is curved in, there is no Rumford throat, and the dimensions of the firebox and opening do not match any Rumford specs. Can I have the mason revise this fireplace to make it as efficient as a Rumford (by knocking ot the back wall, dropping the front lentil 6 inches, etc). Or should I just drop the front lintil to 48 inches or so, which is more consistent with a traditional fireplace? I am at a loss. This fireplace was built to be the focal point in a great room, in a country house with expansive Catskill Mountain views. The damper is 5'6" wide and 12-1/2" deep, with two openings, each 2'3" x 6" with a space of 8" steel between them. Part of the problem appears to be that smoke gets trapped in front of the damper, where a 3" steel lentil runs the width of the fireplace, along with the 2-1/2" edge of the damper itself. The smoke swirls in a circular motion there and then just comes out of the firplace opening at the top. I attach a picture. Any advice is appreciated. I am happy to pay for the advice as well. Sorry this has happened to you Susan. I'm not surprised that the fireplace smokes. I've never known of a fireplace over about 48" tall without a Rumford throat that didn't smoke. But to be sure that it's the design and not something else such as negative indoor air pressure, you might like to review the advice on smoky fireplaces at http://www.rumford.com/smoky.html You can short circuit the details and just see if the fireplace draws with the front door of your house wide open so that you know the problem isn't a tight house with too negative of an indoor air pressure. Now, how to fix it or "Rumfordize" your fireplace. If you were specific, gave your mason a plan, and he didn't follow it, I think you can make him rebuild it correctly as he should have in the first place. He guaranteed it after all, you said. Hope you haven't paid him. But even if you have, you have recourses if he's unreasonable - such as your general contractor, the BBB and your mason's bond, usually required by his insurance company and the city or state who issues him a business or contractor's license. We have a plan for a 72" wide by 54" tall Rumford that's pretty close and can serve as the plan for your 68"x60" fireplace. The plan is on line at http://www.rumford.com/R7254plan.gif Your fireplace is only 4" narrower and 6" taller but our 72" plan will work with those minor differences. It may be fairly easy for your mason to remove the firebox and work within the fireplace opening to rebuild the box and install our Rumford segmented throat and Vestal 48" damper. Probably his smoke chamber and flue lining are okay - although you should check to see that the flues are 24"x24" flues (which measure about 21" square inside) as specified and required by code for this size fireplace. Even if he has to remove some of the stonework over the fireplace opening to install the throat and damper, this shouldn't be too difficult for a stone mason and he should be able to re-set the stone to match. I notice that the firebox is built with stone rather than firebrick. (Whether or not this is a good idea is another question.) One alternative, especially if the flue size is too small, might be to build a smaller Rumford fireplace within the existing opening. For example, a 60" Rumford 54" tall as shown at http://www.rumford.com/R6054plan.gif could be built with an inner surround 4" on each side and 6" at the top to allow for the new firebrick or stone firebox to be built within the existing firebox. The end result could look sort of like the picture at the right only bigger, of course. I think this alternative would be my first recommendation and it would be easier for the mason. Let me know how it turns out. If your mason is cooperative, as he should be if he's a professional, we will be glad to promote him once he learns how to build a Rumford.